UP Athletics wrote: MBB: @PilotHoops signs Ty Glover, versatile 6-7 wing from San Bernardino Valley College! Coach Porter wrote: "He brings an exciting blend of skills, size and athleticism to our program. We like the fact that he is a multi-positional player, who plays with a great deal of energy and really competes. We still have a very young roster, so he will also bring a level of maturity and confidence to the floor that I like." BUT, now you guys dont have to listen to me drone on about the need for an experienced post player, I believe the young post guys will do Ok and NOW they get to sink or swim.... and hopefully adapt to D-1 ball quickly. Welcome Ty and Go Pilots!!! Ty has a 7 foot wingspan and excellent quickness(Making it challenging to score on him)... also great for rim protection....yes! Hope this assessment from his JC coach transfers to D1. "Tymoryae is a 6-foot-7, multi-positional perimeter player with elite athleticism," said Quincy Brewer, head coach at San Bernardino Valley College. "He is a two-way player capable of making a significant impact on both ends of the floor. Love his size and wingspan... having someone that can guard multiple positions is always a useful thing to have. And that swingman position is something we had a need for. Seems like a good fit for our roster. One note... he shot 39% from three last year (19-49), but only shot 60% from FT (24-40). So maybe he's more of an opportunistic shooter than a pure shooter, if that makes sense. But hey, if he can reliably knock down a corner three and play good defense, he'll be a great asset. Remember, this was taped in the first semester of his freshman JUCO year, one would imagine he's played and developed quite a bit since then. I'm not sure Ty was the leader of his SBVC team this season, but at the same time we should remember that 5 players on his team, including Ty, are now committed to D1 schools. Finally, I'm told Coach Johnson considers Ty the most athletic player he has recruited outside Klay Thompson at WSU....that's saying quite a bit, IMO. The best athlete (RJ) leaves the team, only to have his scholarship taken by, presumably, the best athlete on the team. With Rashad's departure, I believe that leaves no more scholarship players remaining from the Reveno era. Xavier is technically the last overall player remaining as a walk-on, though there was that half a season-ish moment last year when he wasn't on the team. 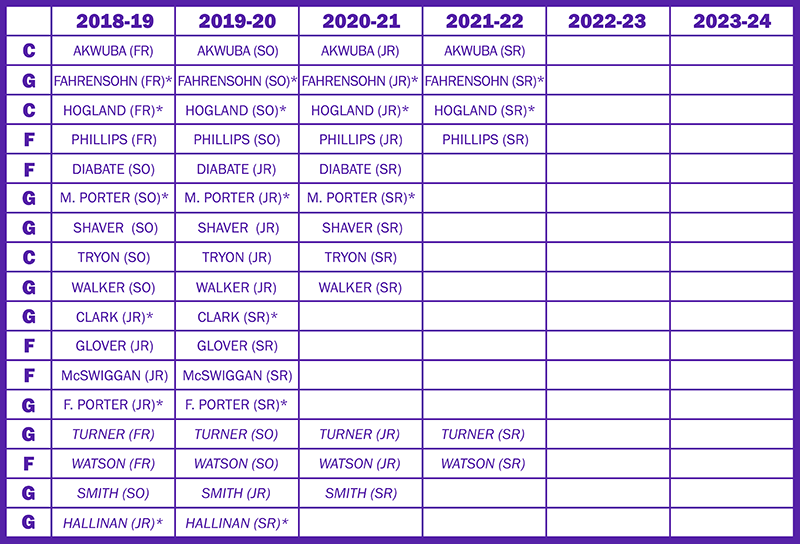 Alongside Stone's departure and X not graduating until the following year due to his redshirt situation, that also leaves us no seniors on the roster this upcoming season for the first time in exactly a decade (2008-09). If you watch the video, one is again struck by the athletic build and abilities of our recruits. Go Ty. Getting good athletes on the court is clearly a theme for the coaches. Now let's get some wins. So, with no seniors, and 17 players on the roster for the next two years, how are we making offers to 2019 recruits? Greyshirts? up7587 wrote: So, with no seniors, and 17 players on the roster for the next two years, how are we making offers to 2019 recruits? Greyshirts? Unlike the "olden days" when guys stuck around at a mid-major for four or five years, now when a player is being told he's good enough to go to a major, or is finding life on the bench is not the life he expected, he moves on. Even without counting the players who left the team as a result of the coaching change (Todd, Monson, Russell, Ferguson, Maker), there have been at least five who have left to get more playing time elsewhere, (Jackson, Stone, Smoyer, Taylor), or to go to a better team (Johnson) in the last couple of years. Without being specific, I predict the Pilots will see at keast two or three players transfer after the 2018-19 season...maybe even one of the coach's sons. Miles Turner said that basketball wasn’t his first priority when he searched for a college, but he found the ideal opportunity at University of Portland. While he likes University of Portland for its academic offerings, he also looks forward to playing for 17-year NBA veteran Terry Porter, who has been the Pilots’ head coach for two years. In addition to his career with the Portland Trail Blazers, Porter has been head coach of the Milwaukee Bucks for two years and the Phoenix Suns for one year. Turner has been playing basketball since the age of 4, including with the St. Bernard’s School CYO teams and the Team Arsenal and Tracy Tar Heels travel teams. At Tracy High, he started during his sophomore year, when the team went 1-9, and by his senior year, he led a team that won the Bulldogs’ first boys basketball title since 1976. IMO, walk-on Miles Turner could be in the rotation as early as his freshman year. Taki and Josh both agreed he was very impressive during his tryout, and was often able to blow by his defenders. Miles had at least 4 mid-major D1 offers that I'm aware (the only two I can remember are Grand Canyon and Montana), and of course the previously mentioned preferred walk-on offer from Purdue, his dad's alma mater. Not mentioned in the article is that his mom went to Notre Dame...so there was also the Holy Cross equation in his decision to attend UP. Still way too early to tell, because we haven't seen whole team assembled and haven't yet had the opportunity to see what progress the returning players are making, but I have Miles no lower than 8th on the depth chart, about the same spot I would also place JUCO transfer, Ty Glover....for now. Ty Glover made his first visit to campus this past weekend, and although it was rainy and cool, the man from Riverside, California "can't wait for school to start and basketball to begin." Ty is listed 6-6 to 6-7 most places, but I'm told he's a legitimate 6-8 and he's a 2-4 guy who can defend the opposing 1-5 guys, which should give him a good chance to be part of a 7 or 8 man rotation as a "utility" player....and he could contend for a starting spot. Most recruits visit UP wanting to see some of the city and lounge around playing video games with their future teammates, but as Ty is already signed, his passion was shooting baskets with Crisshawn and playing pick-up games in the Beauchamp Center. NoPoNeighbor wrote: Last year's recruiting class was "top 10" according to Hoop Scoop. Does anyone have a subscription there to tell us where this class ranks? I think the Hoop Scoop rankings are published this week, but looking at some of the others school's recruits, I'm guessing the Pilots will be somewhere around #40 this year. In 2017 UP had four recruits in the top 100 (Diabate, Fahrensohn, Shaver, and McSwiggan), but that won't be the case this year. Of the four new guys (Akwuba, Glover, Tryon, and Phillips), I think the only one who has any chance of being a top 100 recruit is Akwuba, but his "newness" to basketball and the inexperience that limited his recruiting may also hurt his ranking. In fairness, however, I think Akwuba, Glover, and Tryon will be in the 8 or 9 man rotation this coming season, while Phillips will likely redshirt. EDIT: According to a Coach Cantu tweet, Theo Akwuba was ranked #100 by Hoop Scoop. I learned yesterday that UP was ranked #40 out of 351 by Hoop Scoop. I'll delve into the article, and break it down as to how each player was rated and how other mid-majors fared. DoubleDipper wrote: I learned yesterday that UP was ranked #40 out of 351 by Hoop Scoop. UP was ranked #40 with 15 points by Hoop Scoop on their list of the top 50 recruiting classes in the nation. As we learned last year, Hoop Scoop ranks recruiting classes based on quality and quantity. After they assign each player a ranking on a scale of 1-10, the school that signs the most good players is ranked the highest. UP’s recruiting class was ranked #6 out of the 8 mid-majors that made the list. While I find their rating system suspect, it doesn't hurt to be included in these lists. I guess we will really have more perspective on last year's class this season. I think this type of rating system is better looked at over time... such as a rolling average over 4 seasons. I am glad that we are getting press here, and it is a sign that our recruiting is getting better... but so is every other school in the WCC. Do you have a breakdown of where the other WCC schools fell? Does GU get included as a mid- or high-major? PilotNut wrote: While I find their rating system suspect, it doesn't hurt to be included in these lists. .....Do you have a breakdown of where the other WCC schools fell? Does GU get included as a mid- or high-major? Only 50 schools are on the list, and UP is the only WCC school. Gonzaga has 3 inbounds, a 3.5 star point guard, a 4 star power forward, and a grad transfer point guard. Grad transfers are not included in the Hoop Scoop system, so GU is "punished" for having only two recruits, while UP has five. The school with the most recruits in Hoop Scoop's top 50 is #6 Arkansas with 8...with a 3.5 talent rating average. Two schools have only 2 recruits, #49T Texas A&M and #49T Iowa, both with 5.5 talent rating averages. UP's talent rating average is the lowest in the top 50, averaging 3.0, tied with #48 Rhode Island, a school with 4 recruits. …...But again, wow, UP’s recruits over the last two years are some of the better we’ve seen on the Bluff, regardless of how they may stack up against GU or any other school. Interesting that Hoop Scoop thought enough of walk-on Miles Turner to place him somewhere in the top 1000 out of approximately 1300 players beginning D1 MBB this season. At the risk of offending some self proclaimed poster optimist and those otherwise feeling called upon to ride to the rescue, it is apparent that Hoop Scoop online in particular and other comments suggesting that our recruits are in the top five should be met with a healthy skepticism. It is nice to be included, and to praised, but I think it means less than we would like it to. That being said, our recruits have a dynamism that is exciting. We will soon see how good they are. I hope for a winning season. Had a chance to shoot-around with some of the new and returning players on the outdoor court this week, and the talent level and athleticism has gone way up from previous years. It wouldn't surprise me if UP's 11 Hoop Scoop top 25% recruits from 2017 and 2018 prove the scouting service accurate during the player's time on the Bluff. "UP was ranked #40 with 15 points by Hoop Scoop on their list of the top 50 recruiting classes in the nation." That is higher than the top 25% of D1 teams. Certainly last year's class was rated far higher than 25%. Hard to pin down what is being said exactly. Up and down this coast there are players both last year and this that were rated with 3, 4, and 5 stars, whereas UP only had one 3* player last year, supposedly its best recruiting year. All the rest of our players have been rated 2*. While you can ignore the mainstream recruiting agencies, who I suspect are likely more reliable, selling Hoop Scoop should be met by healthy skepticism, as previously suggested. Lest we forget, Student Pilot regaled us last year with some truth about our recruits, strongly endorsing former USF guard Soule Boom(sp?) as better than our group of guards, despite the rating---USF appeared to have a better recruiting class than we did when they played us: their overall performance far exceeded our own, and they had a new team too. Hoop Scoops exaggerated rating did nothing to undermine the reality. I am not a detractor of the recruiting results, but as one poster here suggested, lets not get out over our skis. Agreed. Getting mentioned and ranked is better than not getting mentioned or ranked. wrv wrote: Lest we forget, Student Pilot regaled us last year with some truth about our recruits, strongly endorsing former USF guard Soule Boom(sp?) as better than our group of guards, despite the rating---USF appeared to have a better recruiting class than we did when they played us: their overall performance far exceeded our own, and they had a new team too. Hoop Scoops exaggerated rating did nothing to undermine the reality. Thanks for the shout-out, yeah Souley Boum definitely lit up the Pilots, and once again I had to buy the pizza. I met-up with one of Souley's friends from Oakland and USF volunteering in Puerto Rico, and he told me that as good as Souley is, he saw there were even better guys who would play ahead of him, so he transferred to UTEP.